Office 2010 has a large number of new features, making it a very rich application suite. The next step in the product evolution was to enable that richness beyond the client installation and enable users to take advantage of features online. In this post I’ll cover some of those features that enable users without Office installed on their device to still be able to participate collaborate and share with those that do. Like many organizations, Microsoft employees attend lots of meetings, a good number of those involve some form of presentation. We are also a very mobile workforce, so lots of attendees can be away from the office where the meeting might be taking place. This can lead to a number of emails being sent with PowerPoint presentations attached. While Exchange Server has had a number of features added over time to help reduce the size taken up in the store by emails with the same attachment sent to numerous recipients, it still can be painful to download 10mb files over slow links. The better solution is to use a product like Live Meeting, but that requires additional infrastructure. 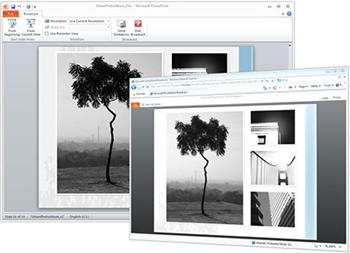 So to help organizations and even individuals deliver a richer experience in meetings without the need for a complete infrastructure, PowerPoint 2010 has a feature call PowerPoint Broadcast. What PowerPoint Broadcast allows you to do is set up an online presentation using the Broadcast service. The broadcast service can be either an internal service using Office Web Apps and SharePoint or the free public PowerPoint Broadcast Service. In PowerPoint 2010 UI there is a Broadcast Slide Show options, this allows you to connect to the PowerPoint Broadcast service hosted by Microsoft, once connected this service returns a unique URL which you can distribute to your attendees. They can then experience the slide show as you intended. Once done, closing the show removes the URL and the show and data are no longer available online. The whole service is controllable via Group Policy. If you want to ensure your organization never uses the public PowerPoint Broadcast Service you can configure the Broadcast Services object in Group Policy to just use internal services. Excel is one of the most versatile applications in the Office suite. We’ve all used it for something other calculations. For those who use it to do analysis and calculations sharing those workbooks around and consolidating changes can be interesting. Within SharePoint there is a service call Excel Services. This shared service within SharePoint 2010 allows you to publish Microsoft Excel 2010 workbooks. The published workbooks are available throughout your organization for knowledge workers to use. These saved Excel spreadsheets in SharePoint Server document library also give other users browser-based access to the server-calculated version of the spreadsheet. When the spreadsheet is accessed Excel Services loads the spreadsheet, refreshes the external data if needed, calculates it if necessary, and sends the resulting output view back through the browser. A user does not need to have Excel 2010 installed to view the spreadsheet. 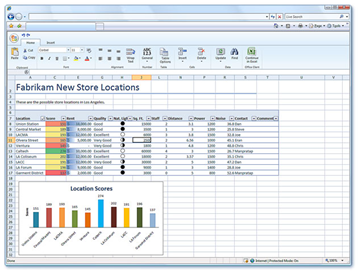 Users will always view the latest version of a spreadsheet, and they can also interact with it in a browser. The other major addition to the Office family is Office Web Apps. Office Web Apps offers Web-based counterparts to the desktop versions of Word, Excel, PowerPoint. In this first version the commands in Office Web Apps are basic compared with the full feature set found in the desktop versions. But even these basic features can help users more easily update and collaborate on the same documents. Office Web apps are compatible not just with IE, but also Firefox and Safari, so you get the same experience regardless of the device you use. Office Web Apps is available to customers licensed for Microsoft Office 2010 through a Volume Licensing program, these customers can run Office Web Apps on a server that runs Microsoft SharePoint 2010. Also consumers or small-business users can use Office Web Apps for free if they have a Windows Live ID. For those customers who use the SharePoint 2010 to deliver Office Web Apps, administration can be done using PowerShell cmdlets. AD FS AQS Beta Books Business Intelligence Cloud Deployment Events Excel 2010 Excel Services; PowerPoint FIM Forefront Hardware Hyper-V IPv6 Jump Start MAP MED-V Mouse MS Press MVA O'Reilly Office 365 Office 2010 PowerPivot Private Cloud Report Builder Reporting Services Reviews Search Security SharePoint 2010 Solution Accelerator SQL Server 2008 R2 SQL Server 2012 System Center System Center 2012 System Center Self-Service Portal System Center Virtual Machine Manager TechNet TechNet Radio Theme Threat Management Gateway UAG VDI Virtualization VSMT Windows 7 Windows Azure Window Server 2008 R2 Windows Phone 7 Windows Server "8"